This was in a store front in Venice Beach. I thought it was real until I noticed there wasn’t a phone number. I can be so gullible. Happy Easter! It looks so authentic. Bummer. Looks real to me! Are the kitties taking care of these poor lost foundlings? That would have been a double take for me too Ashley! Freaky little things that they are..lol. Hope you had a great Easter. I love the balloons! This is the oddest thing I have seen in a store front in awhile. I think I would be intrigued to go in this store cause the store front displayed this crazy poster. I would just want to meet the people inside. 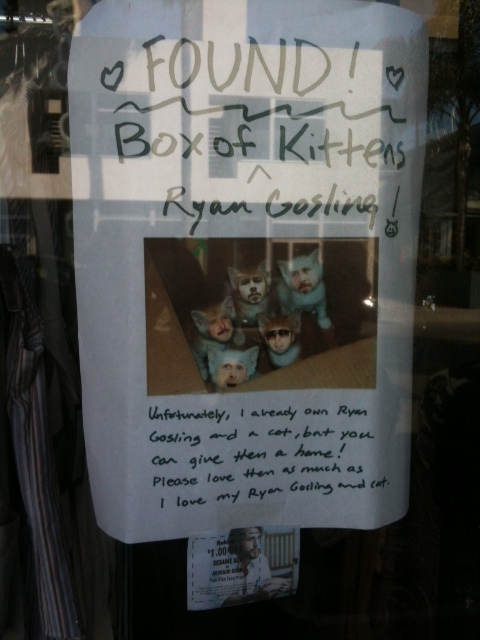 Ryan Gosling IS a kitten. Hello – sorry to sort of spam you here (this isn’t related to your post) but I got an award on my blog and part of the award involves naming ten other blogs that you want to pass the award on to. So … you made the list. Happy happy joy joy!